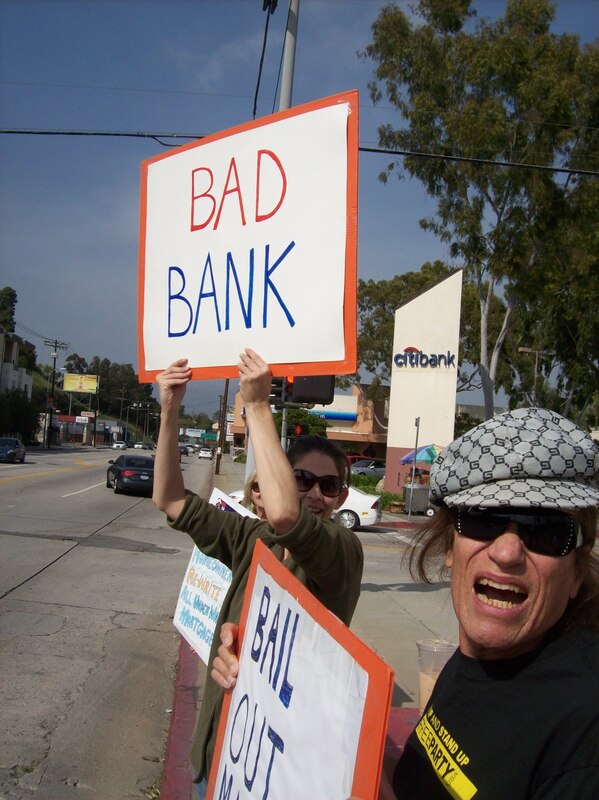 A few Saturdays ago I was elated to see a protest in front of Bank of America in Silver Lake. Even though most of my bad experiences have been with CitiBank, this action was directed at multiple banks. This weekly demonstration has been going on almost uninterrupted since spring of last year. When it has been postponed it has been because the core group has participated in other events. For example, they had a contingent in the antiwar march of March 19 and the workers' march of March 26. 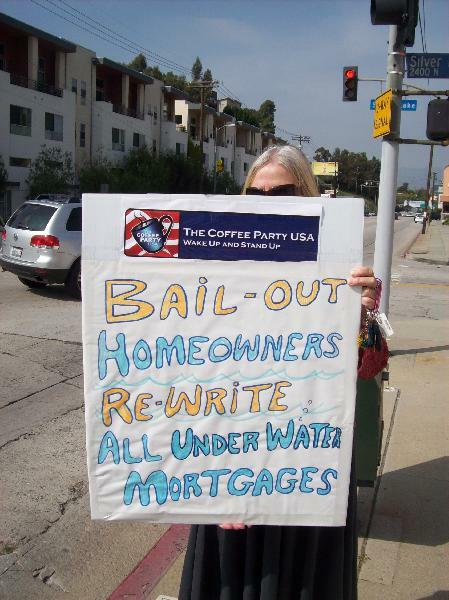 The weekly demonstrations resume Saturday, April 2 at its usual time: 1:30pm to 3 at the Bank of America on 2420 Glendale Boulevard (at Silver Lake Boulevard), 90039. The action is organized by the Silver Lake-Echo Park chapter of The Coffee Party. This is the only branch engaged in this activity. (In fact, when I participated, there was a couple who had traveled some 90 miles to be there.) Hopefully these types of demonstrations will become more widespread. Organizer Heather Meyer explained the origin of this endeavor. “We were trying to figure out a way to get The People interested in supporting the financial reform effort. We thought the main reason why people weren't talking about it was because they thought it had nothing to do with them or their daily lives. 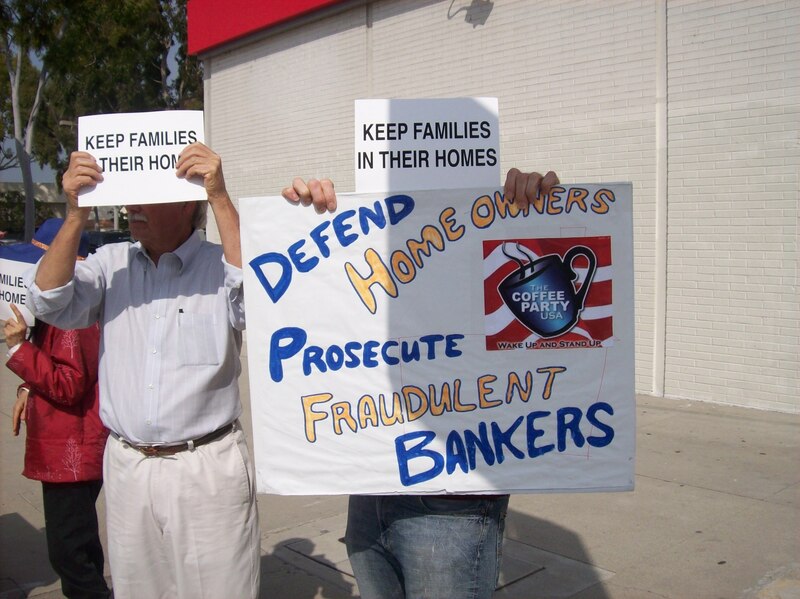 That's why we chose a focus on the foreclosure crisis--the economic collapse was caused by banks and financial institutions gambling on mortgages via Wall Street. Everything else is connected to that one problem (massive taxpayer-funded bailouts for the banksters, lack of oversight on financial institutions and banks, etc.) and obviously, the people are still getting the sh*t end of the stick. “As we were watching the financial reform take shape in Congress we believed that the root cause of the economic collapse was not being properly addressed (no real curb on the gambling, no serious regulations on mortgages, no real oversight on the home modification programs, etc. 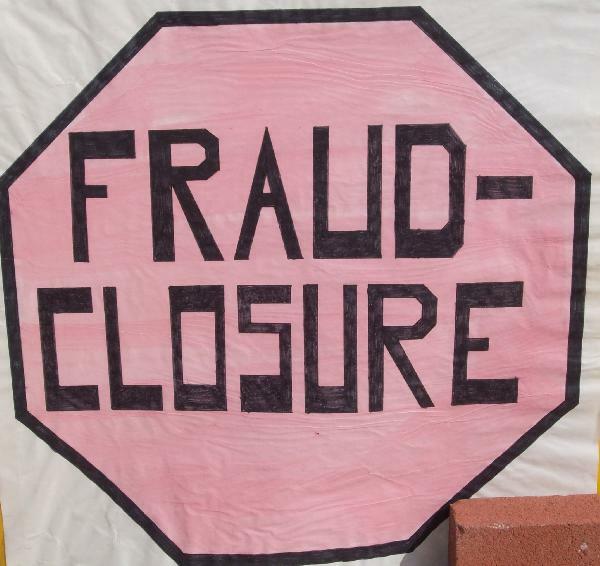 ); therefore, we also believe there is going to be a second market crash via foreclosures. We also do presentations to educate the public and sometimes for local officials too. We also have a door-knocking campaign where we reach out to our neighbors and we offer resources for refinancing and so people know their rights (as homeowners and tenants). Given my own ongoing problems with the predators at both CitiBank and my current bank, this demonstration will continue to be therapeutic for me, and it's a way to fight back . 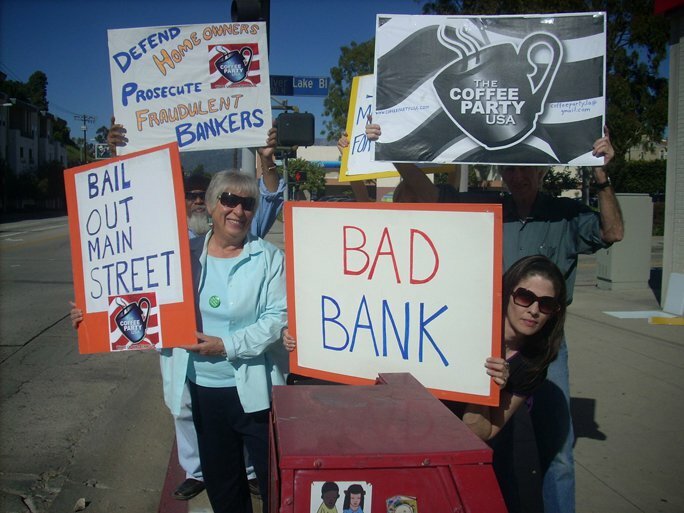 At the time of this writing, Bank of America had not formerly engaged any of the demonstrators (although they once called the police because of honking caused by the signs).